The nice thing about decorating with toile is you get to mix and match patterns. You do not have to stick to one scene. 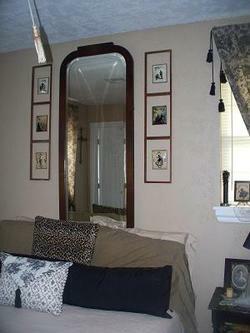 My walls are a sand colored taupe. 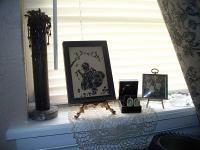 A black and taupe toile floral sets the stage for all my beaded purse collections and aged black and white prints such as the St. Bernard carrying a baby in a basket (pictured on the right). 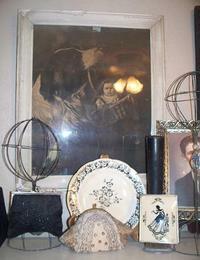 Vintage black and white photographs of my family dress bedside tables and cabinet tops. Clustered together they bring a cohesive theme of then and now to memory. 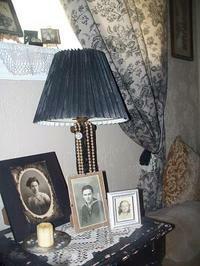 I hung strands of old Austrian pearls from the lamp to add a touch of sophisticated charm. What is your ebay handle?